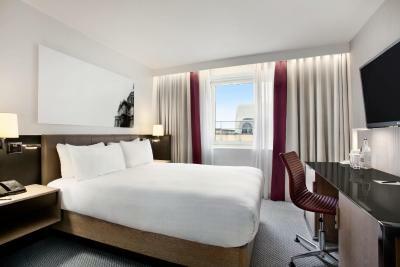 Lock in a great price for Hilton London Angel Islington - rated 8.4 by recent guests. Very relaxed and easy going but attentive at the same time. Excellent value for money. Staff very friendly. The breakfast layout was superb but the coffee was luke warm. The full English was good and the pastries better. 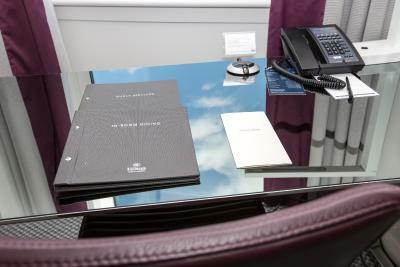 Quiet,, well proportioned room with great facilities. Location, facilities, breakfast. Keep in mind breakfast is until 11, but for some reason the staff decided to pack it all up at 10:20 while I was still having my breakfast on the second day of our stay. And because my negative comment is too long so I can't fit it there, let me put it in the positive comment instead - on 3 separate occasions I had a member of staff unlock my room door for me as the 2 room cards were not working. Twice they had to be replaced before on my final 2 days me and my wife were able to use them without issues. Staff were so friendly, I got a free room upgrade. The room was just amazing and beautiful. The location and value for money was actually shocking. I will be staying again. The ataff at the reception was professional. The location of the hotel was excellent, as it was close to my course. The bed was comfortable, the bathroom lights were good, the shower water pressure was great too and the cleansiness. We were happy that the safe was easy to use & that we were able to set our own password. 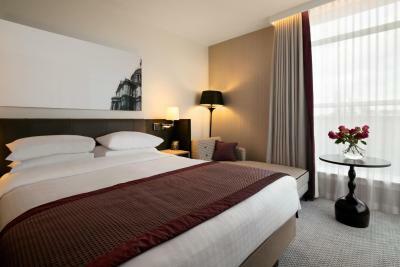 Nice luxury feel to my room and very central location. 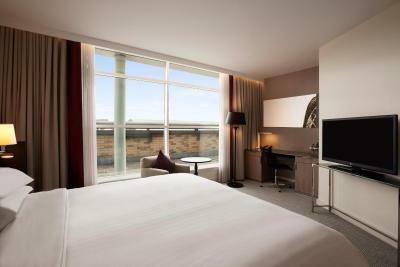 One of our top picks in London.Hilton London Angel Islington is situated in the heart of fashionable Islington. 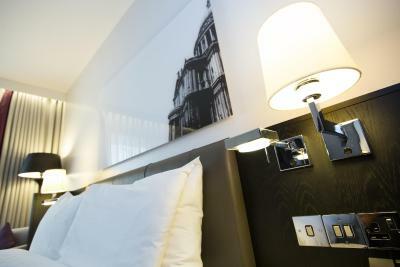 This sleek, contemporary hotel is a 5-minute walk away from Angel Tube station and offers fitness and meeting facilities. Free limited WiFi is available in the public areas. 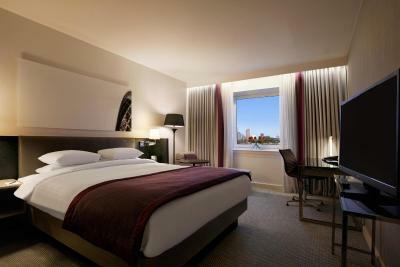 Hilton London Angel Islington is just a 5-minute drive or short Tube ride from the St Pancras International Eurostar terminal and Kings Cross Rail Station. 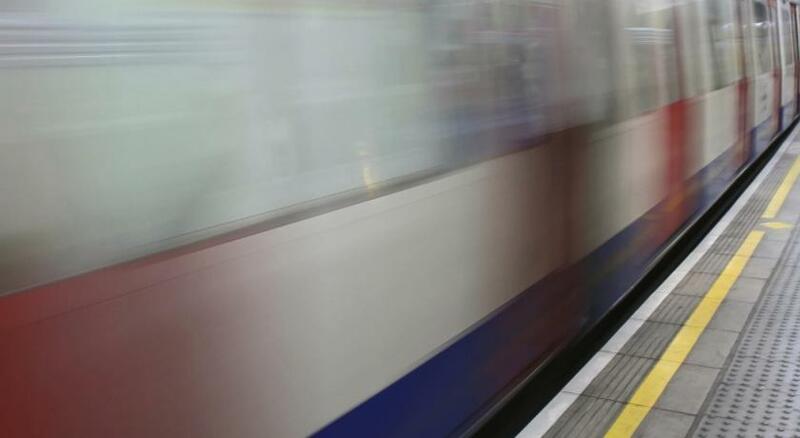 Fashionable Islington offers numerous boutique theatres and restaurants within 5 minutes’ walk. 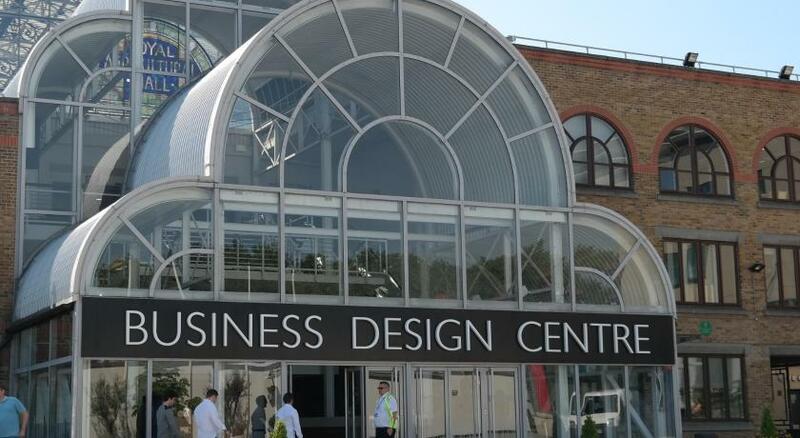 The hotel is adjacent to the Business Design Centre, one of London’s most popular conference and exhibition venues. 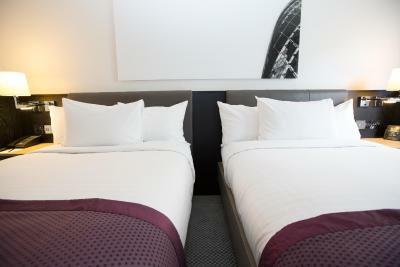 Hilton London Angel Islington has been welcoming Booking.com guests since 31 Jul 2009. 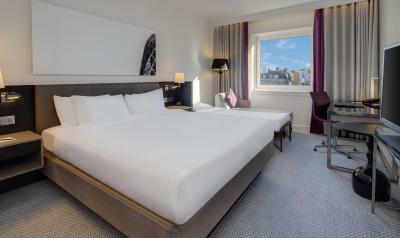 When would you like to stay at Hilton London Angel Islington? 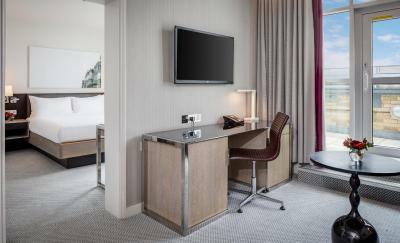 This bright and airy room features innovative décor and a 42-inch flat-screen TV, along with a work desk and twin beds. Some rooms have city views. Public parking is possible on site (reservation is not needed) and costs GBP 40.80 per day. 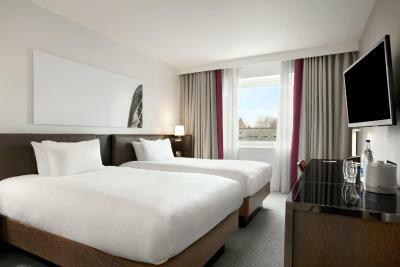 These air-conditioned rooms feature a 42-inch flat-screen TV, recliner chair and en suite bathrooms. 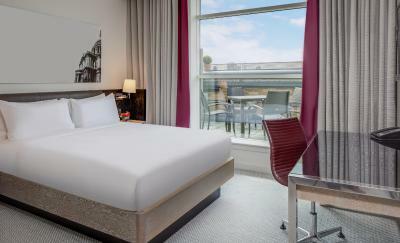 The room offers free WiFi and some have city views. 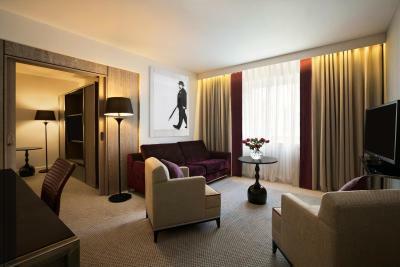 This luxurious suite features a bedroom area with a king-size bed and a 47-inch plasma TV, separated from a spacious living room by sliding double doors. The living room features a second 42-inch TV and a comfortable sofa bed. 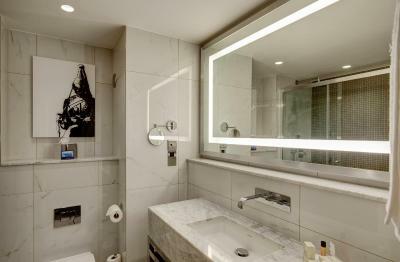 Most suites feature a bath tub with an overhead shower. Walk-in showers can be requested when booking. Some suites offer interconnecting options. Special touches include complimentary half bottles of wine and bottled water, a bathrobe, slippers, and additional bathroom amenities. Guests have access to the Executive Lounge, with complimentary breakfast, evening canapés, snacks and drinks throughout the day. 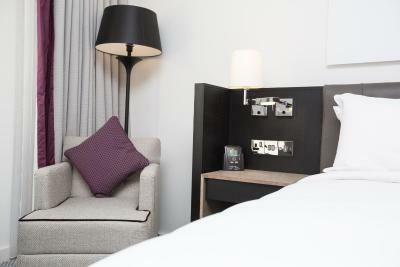 This suite can accommodate 2 adults and up to 2 small children or 3 adults. 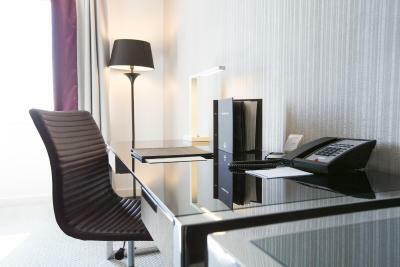 This bright and spacious room has a 42-inch TV and a large work desk with high-speed internet available at an additional charge. 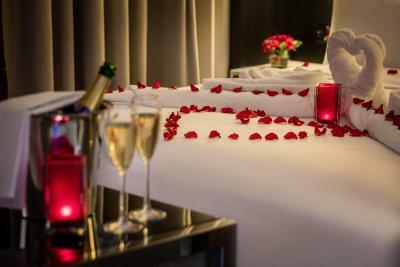 Special touches include wine, bottled water, a bathrobe, and slippers. Some rooms have city views. Guests have access to the Executive Lounge, where complimentary WiFi and breakfast can be enjoyed, along with snacks and soft drinks throughout the day. This room can only sleep up to 2 adults and 1 child. 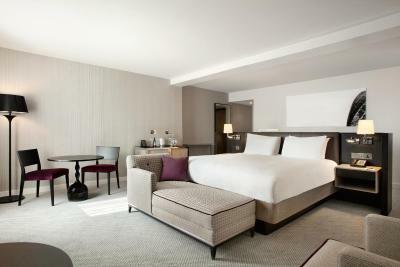 Featuring 2 queen-size beds and a cozy seating area, this spacious room has enough space for an additional bed. Special touches include a bathrobe and slippers, complimentary half-bottles of water and wine, and extra bathroom amenities. 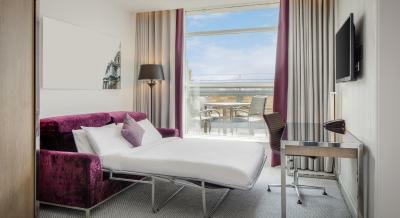 There is a chaise longue and a 42-inch flat-screen TV. 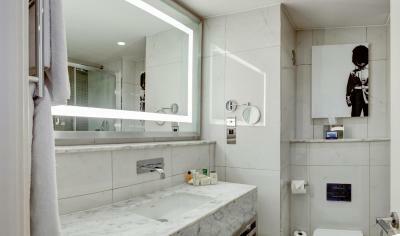 With extra bathroom amenities, this room features 2 large single beds and complimentary mineral water and wine. 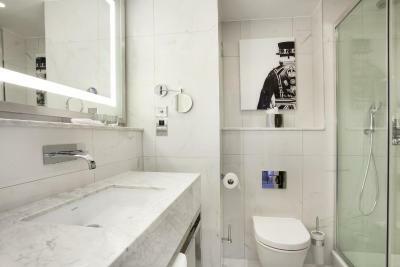 The private bathroom includes a bath tub, with a bathrobe and slippers. 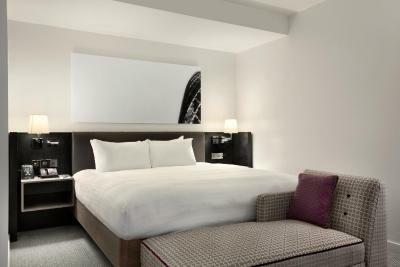 This room includes a fluffy Hilton bathrobe and slippers, complimentary small bottles of water and wine, and extra bathroom amenities. Most rooms have a walk-in shower, and others have a bathtub. Please request preference when booking (always subject to availability). 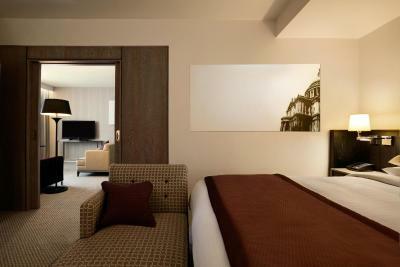 This room has 1 queen-size bed and features wide entrance and bathroom doors. 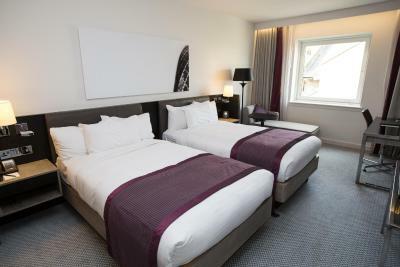 All rooms include low-mounted hangers in the wardrobe, a low-level spy hole on the main door, an emergency pull cord next to the bed and a control panel for room lights on the bedside table. An emergency evacuation strobe light is installed in all the accessible rooms. An emergency vibration pillow is also available upon request. Most rooms have a walk-in shower, while others have a bath. Please request when booking (always subject to availability). 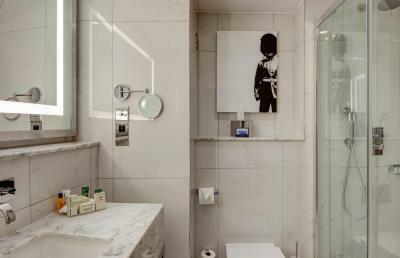 The suite contains special touches, including complimentary half bottles of wine and water, fluffy bathrobe and slippers, and additional bathroom amenities. Benefit from exclusive access to the Executive Lounge with complimentary breakfast, evening canapés, snacks and drinks throughout the day. 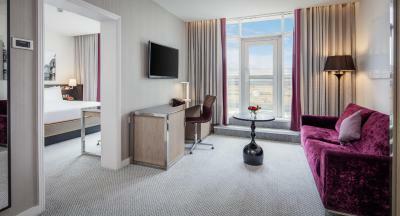 This suite features a balcony with city views, queen-size bed and a 42-inch plasma TV. 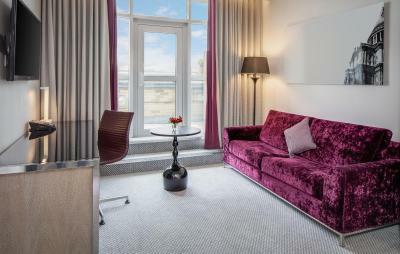 The living offers panoramic city views, and there is a sofa and dining table featured. 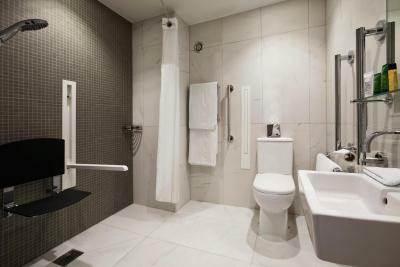 The en-suite has a walk-in rain shower. 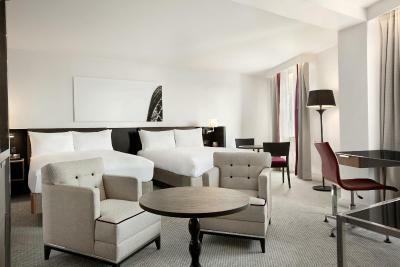 You will find complimentary wine and bottled water, bathrobes and slippers. Guests of this room have exclusive use of the Executive Lounge which offers a complimentary breakfast, evening canapés, snacks and drinks throughout the day. This room can accommodate either 2 adults and 2 children or 3 adults. 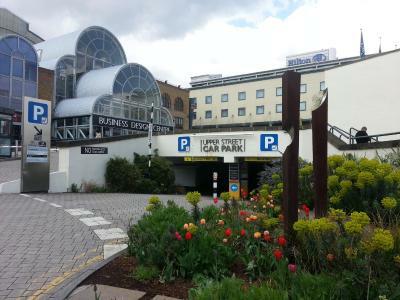 Hilton London Angel islington offers an amazing location in the heart of Islington, however not only because it is within a 5 min walk from Angel tube station, on the Northern Line. It is also just situated off of Upper Street, surrounded by quiet residential buildings, guaranteeing a calm and peaceful environment to spend the most relaxing stay in one of our sophisticated retreats. And if you want a bit of action, the vibrant "Supper Street" is just on your doorstep, offering a plethora of international restaurants & bars and chic & trendy boutiques. Should you decide to come visit us for a cultural break, we can recommend some of the greatest theatres the city has to offer, and all within a 10min stroll from the hotel: Almeida Theatre, Sadler's Wells, Little Angel Theatre, and more! House rules Hilton London Angel Islington takes special requests - add in the next step! 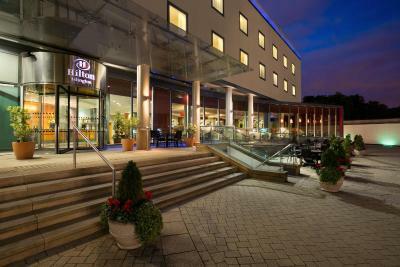 Hilton London Angel Islington accepts these cards and reserves the right to temporarily hold an amount prior to arrival. No tea and coffee making facilities in the room . Hard bed😫 The housekeeper gave me a duvet to put on top of the mattress, but unfortunately it did not help! No apparant working extractor fan in bathroom. I had to phone down every day for extra milk. The inner courtyard could do with some TLC, it looked rather neglected. no breakfast location very good. No water in room for guests , Mentioned in email we were traveling for my partners 30th birthday and asked for something to be done to mark the occasion and nothing was mentioned so was disappointed. Could have done with better lightning in the room so could do make up. Difficult in bathroom as couldn't get close to mirror. I was hesitating to write before I get a resolution on the incurred extra credit card charge from the hotel but then I read the comment from 2 days ago by an anonymous client who apparently had the same issue. I don't know if this was caused by incompetence of the reception staff or by a system issue, but when I arrived I tried to pay by card and got confirmation that all was OK. On the next day I got a note slipped under my door to go to reception and fix an "account problem". There, my nightmare began when I had to waste hours of my life explaining to a receptionist lady that I had already paid and even showed the blocked amount in my online banking app. I was told multiple times that I am in the wrong. I also found odd that my card details were written down by staff after I had paid already. After seeing that I got agitated the lady at reception told me that "she will take care of the problem", so that I can enjoy my remaining 3 days at the hotel. This "taking care of the problem" apparently meant that Hilton will then charge me a second time for the same amount, but the extra bonus here is that they did so 2 hours after I had checked out on the last day of the stay, on my way to the airport, after being explicitly told by another receptionist that all was OK with my payments. It has been 14 days since I had my money blocked in my account and my emails have gone ignored, while my phone calls returned no resolution except for empty promises that I will get my money back. Hilton - this is an unacceptable way to treat your clients and an urgent problem with your payment system that you should deal with immediately before you ruin other client's customer experience! Also, make sure you tell your receptionists that telling customers that their English is bad and they can't understand what you're saying is incredibly rude, especially since the receptionist speaks with such a heavy accent herself. The rooms were small (Paris style) and the utensils at vreakfast were not clean. Also, as I am allergic to wheat and to milk, I missed having the oats served in a separate recepient (not mixed in a müesli tha cointaibed wheat). Was given an accessible bathroom, which meant the shower got much of the bathroom floor wet and I had to mop up. Location, cleanliness, quietness. Very helpful manager especially last night overnight manager was very helpful in assisting me to load up the Uber when departing. When we arrived, we were told we had to wait around an hour for our room to be ready - due to business conferences being held late. The only reason this was an issue was because we were in a rush to get somewhere and had already arrived at the hotel later than the time the room would be available to us. However, the staff member dealing with our check in, did manage to speak to house keeping & shorten our waiting time for our room which we were pleased about. Unfortunately I do not remember her name, but thank you.